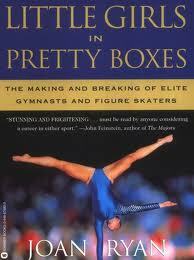 In 1995, as a high school student, I read the first edition of Joan Ryan's book "Little Girls in Pretty Boxes". I picked it up because I figure skated for many years (from age 2-14). Little did I know that I was starting my first exploration into public health. The book examined public health issues like eating disorders and sports injuries. It argued for policies that would protect young figure skaters and gymnasts from injury and from exploitation by their coaches, families, and industry. Ryan conducted intensive interviews for the book, which allowed her to highlight several cases like that of Christy Henrich. Henrich was a talented and promising U.S. gymnast who died from anorexia at the age of twenty-two. I thought of this book today when I read a beautiful and honest blog post by Jennifer Kirk called, "An Unrealized Dream". Jennifer Kirk is a decorated, elite U.S. figure skater who retired from competitive skating in August 2005. She retired in order to focus on her health and to recover from bulimia, alcoholism, and cutting. Her post highlights the complexities of these health problems. They were influenced by her sport, her family, her support system, her early independence, and the pressure that was put on her to have a successful career. "A few months before I quit skating, my dad and coaches found out about my eating disorder, but nothing was done to get me the help I needed. This reinforced my belief that skating and my career held paramount importance over other aspects of my life." Recently, much of the discussion of elite athlete safety has been focused on the National Football League (NFL), but the same questions are applicable here. Are athletes putting themselves at risk by playing with injuries (e.g., concussions)? What is the current organizational culture and does it support an intervention to protect athletes? Do the coaches and trainers really have the athletes' best interests at heart or are they focused on winning and protecting their investment? What do you think? What more can we do to protect athletes at all levels (from recreational to elite)?